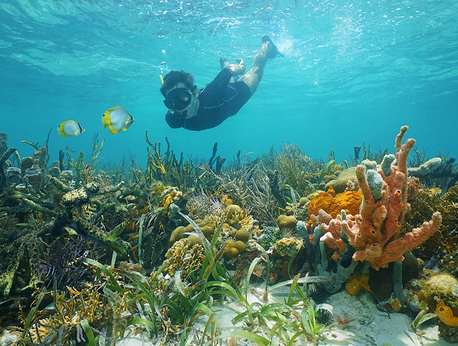 Snorkeling in the Caribbean is unlike anything else. The beautiful coral reefs are undisturbed so you will be able to really see the wildlife and fish underneath the water. On this tour, we will begin with a boat ride over to some of the best spots available. This way you don't have to worry about where to go! The equipment is included so sit back and relax as you enjoy the views. Be sure to watch out for sting rays in the water. Once we arrive, you will be able to swim and snorkel as you get to see the sea life up close. After you enjoy your time relaxing and snorkeling, you will enjoy a delicious meal with unlimited beer, liquor, and soft drinks. The food and drinks are unlimited so you can indulge! After we will go back to the beach club where you will be able to relax even more. At the beach club, there are many amentities for you to use including beach chairs, a playground for kids, shops, and beach games. There is even an ocean trampoline that both adults and children will enjoy. I have been to the Bahamas many times, but Reef Snorkel & Beach Break is one of my favorite trips! It includes everything that everyone should do here. As a Bahamas veteran, I can say only the best about this experience!